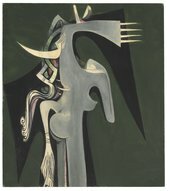 I was particularly inspired by Wifredo Lam's earliest work and his Afro-Cuban heritage. The playlist takes you through songs that represent different stages of his life in a sort of chronology, focussing more on the Afro-Cuban and religious influences that Lam had. The first song I picked was one of the tracks I made in Havana. You can hear field recordings of Havana's old town before trumpet, keys and congas come in. Having visited Cuba twice in the past few years to perform and collaborate, I know how much of a rich tapestry of culture, art and music there is over there and believe even before the Cuban Revolution, Lam would have been influenced by this. I personally have always been interested in the 'Black Atlantic' - the influence/movement of African rhythms across the Americas via the slave trade. This song is from Haiti but you can hear the fusion between big band jazz and African drumming that demonstrates the cross-pollination of these musical cultures. Religion plays a big part in Lam's work, particularly Santería, where rituals from West Africa sit next to Spanish Catholism. This track is a vodou drumming ritual recorded in Haiti. 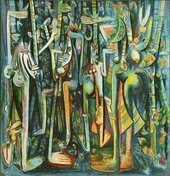 I loved the paintings around the time of The Sombre Malembo, God of the Crossroads 1943 and The Jungle 1943. Unfortunately The Jungle was not on display, but my selection of the Yoruba Singers' track Ojinga's Own depicts these compositions, some of the more colourful pieces in the collection. Yoruba is the theme of the next song produced by Afefe Iku, a practitioner based in Greece. 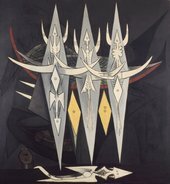 There is a spiritual element to all of Lam's work which I found fascinating. I was inspired by Lam's travels. He had a very hard life but it must have been an amazing journey! I selected the Ornette Coleman song as a song representing the international contacts that Lam fostered during his time in Europe and the United States. 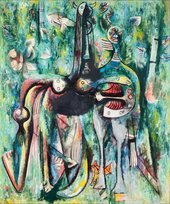 Lam became influenced by the likes of Jackson Pollock, whose artwork appeared on a Coleman release. Lam's life was full of challenges and hardship, and I felt that as time went on this was reflected more within his art. His later work such as The Threshold 1950, The Soulless Children 1964 and others are dark, almost gothic, but beautiful. To me, Hater by Various Production is both beautiful and dark and sprang to mind as I looked at these pieces. 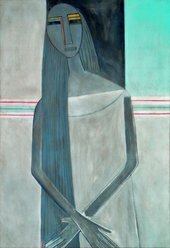 Some of Lam's works from the 1960s depict ghost-like figures that are playful and almost caricatures that might be from a Disney film. I chose Ibeyi's Ghosts to represent this period. They are two sisters originally from Cuba who have found international acclaim in recent years. My final song brings things back to Cuba and the roots of modern Cuban experimental music. When in Cuba, I was very lucky to be invited to record at the Laboratorio Nacional de Música Electroacústica (LNME), a recording studio set up by Juan Blanco and now run by his son Manuel. 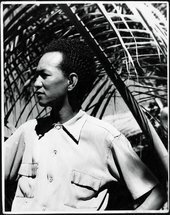 Blanco pioneered early electronic compositions in Cuba in the 1960s and demonstrates that Cuba is not all about the Rhumba! This ambient piece is dark and mysterious and I thought it would be a good closing piece to sum up Lam's work. Find out more about Brian's recordings in Cuba. Brian curates playlists for Open Ear Music. Enjoy some of our other playlists.